I bet you were starting to think I only featured women from back in the day . . . well hopefully you will be pleasently surprised with this week's feature. 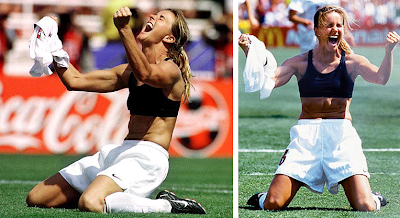 Brandi Chastain who most of you know plays professional soccer and is famous for taking her shirt off after scoring the fifth kick in the Women's World Cup and beating China. Though it was a "moment of insanity" it pushed our society to look at women athletes a little differently. It wasn't right or wrong just something no other woman had done before. So celebrate your life and have your "moments of insanity" it might just change the world.